The Swings with Kids program is a golf instruction program within school districts which reside within the state or Iowa and/or Iowa PGA Section boundaries. The Swings with Kids program will introduce the game of golf with the direction of Iowa PGA Professionals inside physical education classes. Students will learn about golf and also benefit from the numerous life skills that the game of golf offers. The vision for the Iowa PGA Foundation Swings with Kids program is “Helping kids excel by introducing them to the life skills that the game of golf provides.” These life skills include character, honesty, integrity, respect, perseverance and cooperation. Our golf is simply for children to “try golf”. One of the primary reasons the Iowa PGA Foundation chose the Tri-Golf and Golf Xtreme equipment is that it is high-quality equipment and curriculum at an affordable price. Since PE classes share equipment, each school generally only needs 1 bag. Many school districts do not have enough of a PE budget to purchase the equipment for their schools. 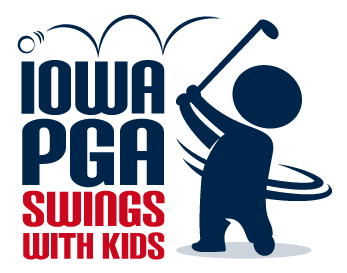 Iowa PGA Professionals are working within their communities to raise funds for the Swings with Kids program. The school districts that do not have a local PGA Professional, however, need your help. The Iowa PGA Foundation does not want a lack of funding to be the reason why golf cannot be a part of your PE curriculum. Give to the General Fund – Funds will be designated for the Swings with Kids program, helping to support unsponsored schools. The Iowa PGA Foundation is a 501 (c) (3) non-profit organization, so all your donations are tax deductible. "Marshall Elementary School is comprised of 70% of its students on free and reduced lunches. This and other factors contribute to only a handful of students having any previous exposure to the game of golf. Being a golfer myself and having assisted in teaching junior golf lessons, in the past, it was great to see my students have the opportunity to learn more about the game of golf. The equipment and the instruction was very appropriate for beginning golfers. Students were excited to have the opportunity to learn that there’s more to golf than just stepping up and swinging away. We are happy the the DCSD and sponsoring partners have provided us with the opportunity to expose kids to this life-long sport as part of our PE curriculum. Additionally, we were very grateful to Jeremy Hawkins for working with our students and enhancing the instruction with his background in teaching young people about golf. "